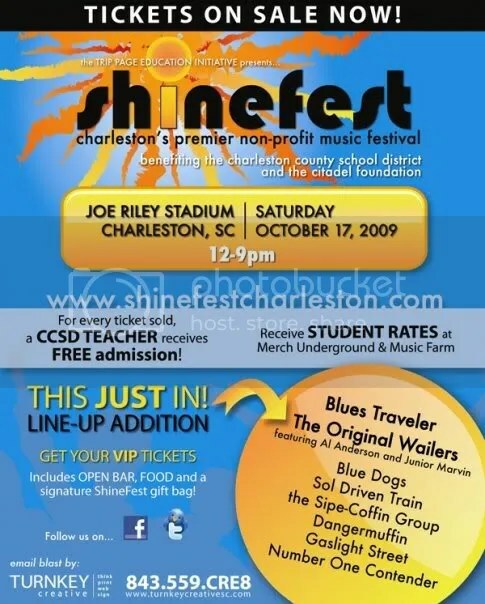 This entry was posted on October 6, 2009 at 10:07 am and is filed under Uncategorized with tags blue dogs, blues traveler, Charleston County School District, charleston events, charleston music, charleston party, Citadel Foundation, Dangermuffin, GaslightStreet & Number One Contender, joe riley, shine fest, shinefest, Sipe-Coffin Group, sol driven train, Trip Page Education Initiative, wailers, www.shinefestcharleston.com. You can follow any responses to this entry through the RSS 2.0 feed. You can leave a response, or trackback from your own site.